Today, 21 December, 2016, is Winter solstice and for people of Chinese descent around the world, today is celebrated as what is known as Dongzhi or the 'Tung' Festival. It marks "the arrival of winter") and this festival is one of the most important festivals celebrated by the Chinese community and other East Asians. This Winter Solstice or Dongzhi Festival is celebrated either on December 21 or 22 of each year. This year it falls on December 21, today. Most mothers (as like mine too) would be cooking up a storm in the kitchen as this day is a time for a family to get together. It is also the last major Chinese festival of the year, the next one being the Chinese New Year. Incidentally Chinese New Year will be on Saturday, January 28. 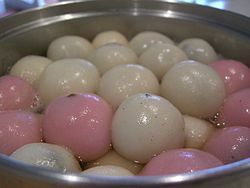 Borrowing from Wikipedia on the Dongzhi Festival..
One activity that occurs during these get-togethers (especially in the southern parts of China and in Chinese communities overseas) is the making and eating of tangyuan (湯圓) or balls of glutinous rice, which symbolize reunion. Tangyuan are made of glutinous rice flour and sometimes brightly coloured. 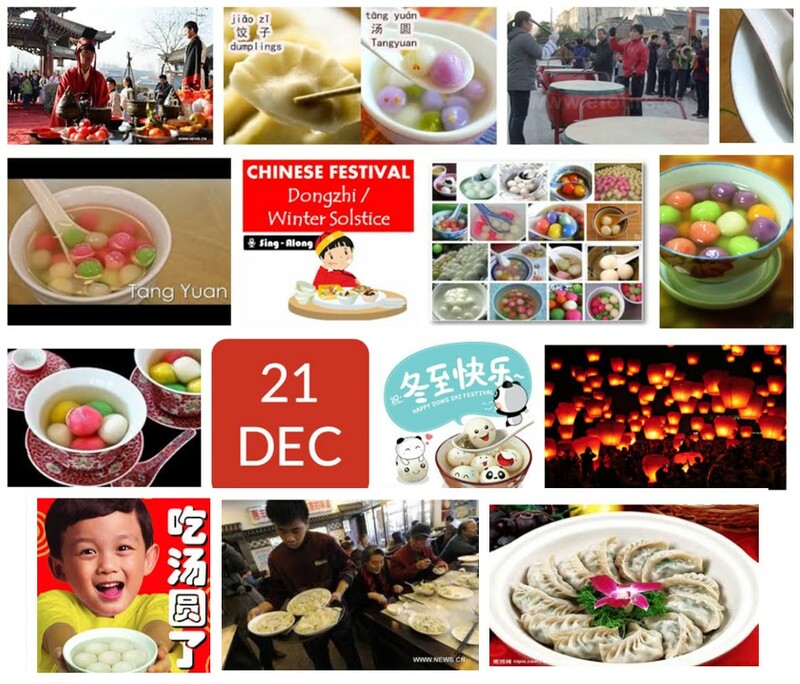 Each family member receives at least one large tangyuan in addition to several small ones. The flour balls may be plain or stuffed. They are cooked in a sweet soup or savory broth with both the ball and the soup/broth served in one bowl. It is also often served with a mildly alcoholic unfiltered rice wine containing whole grains of glutinous rice (and often also Sweet Osmanthus flowers), called jiuniang - but this one is probably still practiced in China. 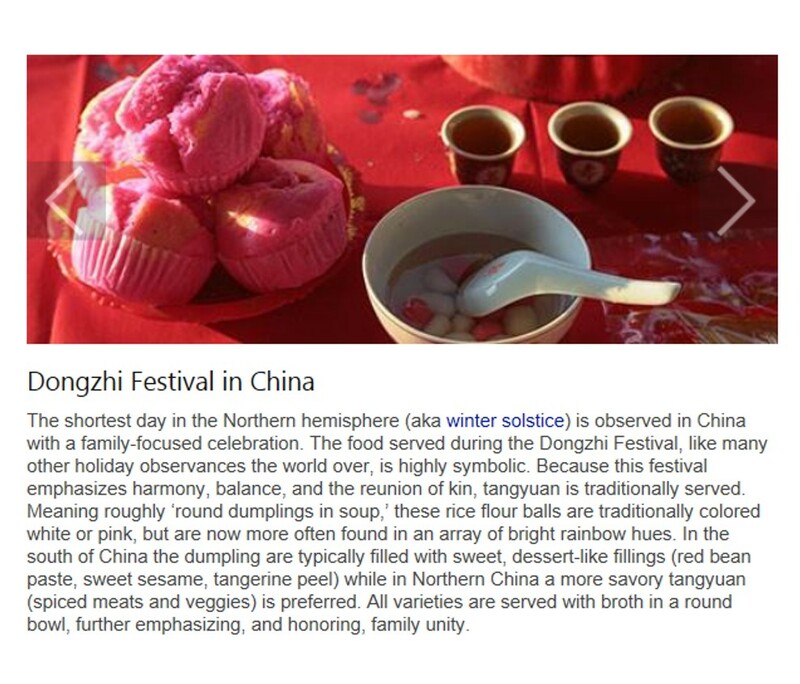 More about Dongzhi - courtesy of Bing.. In northern China, people typically eat dumplings on Dongzhi. Wikipedia has this to say about its origin.. It is said to have originated from Zhang Zhongjing in the Han Dynasty. On one cold winter day, he saw the poor suffering from chilblains on their ears. Feeling sympathetic, he ordered his apprentices to make dumplings with lamb and other ingredients, and distribute them among the poor to keep them warm, to keep their ears from getting chilblains. Since the dumplings were shaped like ears, Zhang named the dish "qùhán jiāoěr tāng" (祛寒嬌耳湯) or dumpling soup that expels the cold. From that time on, it has been a tradition to eat dumplings on the day of Dongzhi. Old traditions also require people with the same surname or from the same clan to gather at their ancestral temples to worship on this day. There is always a grand reunion dinner following the sacrificial ceremony. The festive food is also a reminder that celebrators are now a year older and should behave better in the coming year. Even today, many Chinese around the world, especially the elderly, still insist that one is "a year older" right after the Dongzhi celebration instead of waiting for the lunar new year. Here in Kuala Lumpur, we are nowhere near winter, of course. 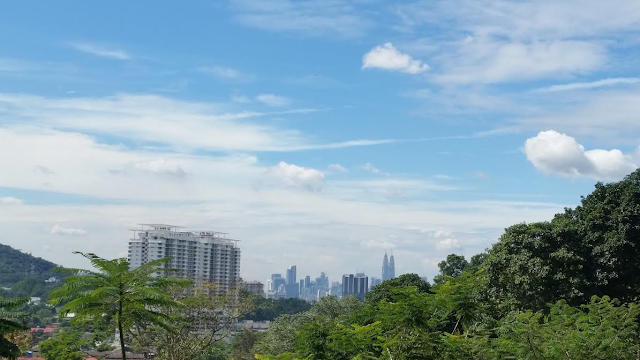 It's a sunny day with blue skies today..
KL skyline in the distance. More and more highrise buildings are springing up downtown. It used to be just the PETRONAS Twin Towers and one or two blocks but look at it now, and more to come. The KL Tower is actually to the right of the twin towers covered from view by that tall tree. I wish you all a Very Happy Dongzhi!